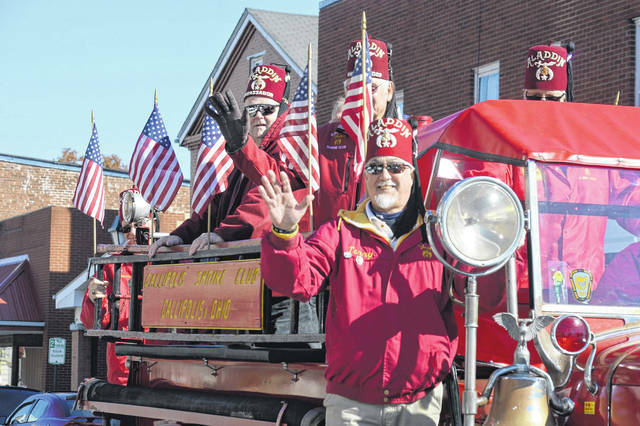 Gallipolis Shriners wave as they drive by. Onlookers and parade participants greet one another. 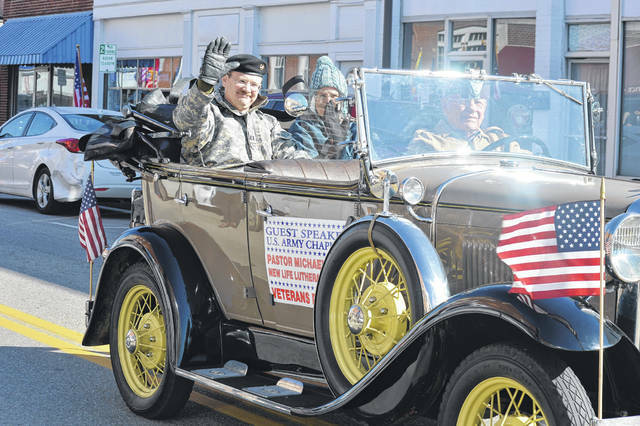 Era weapons for respective historical conflicts have often been displayed during the Veterans Day Parade in remembrance of veterans. 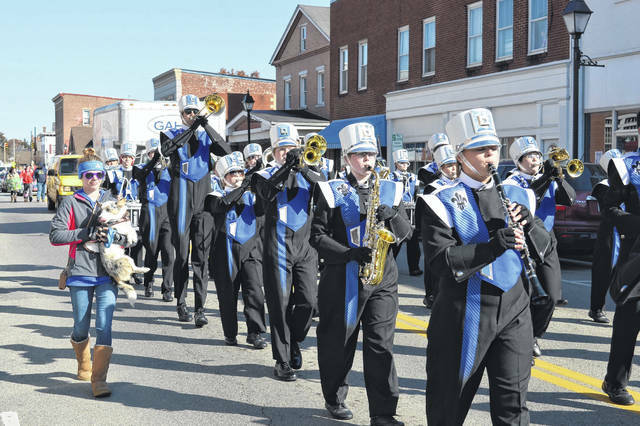 Gallia Academy High School’s marching band strides to the beat. 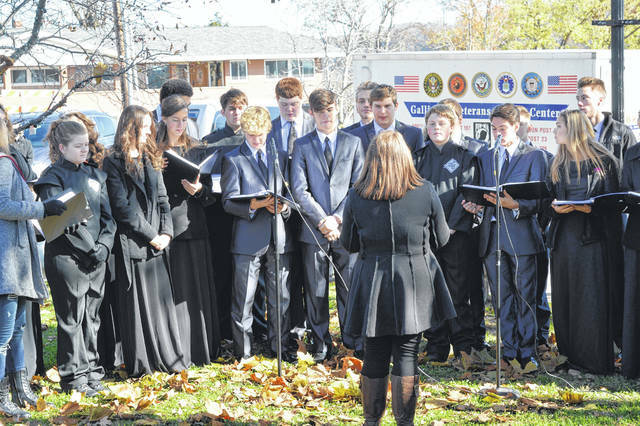 River Valley High School’s show choir sings patriotic songs. New Life Lutheran Pastor Michael Giese notes the importance of unification in the United States. 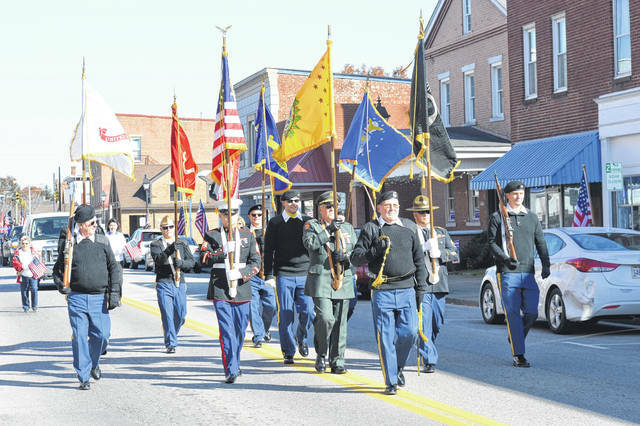 VFW Post 4464 Honor Guard strides down Second Avenue at the head of the Gallia Veterans Day Parade. 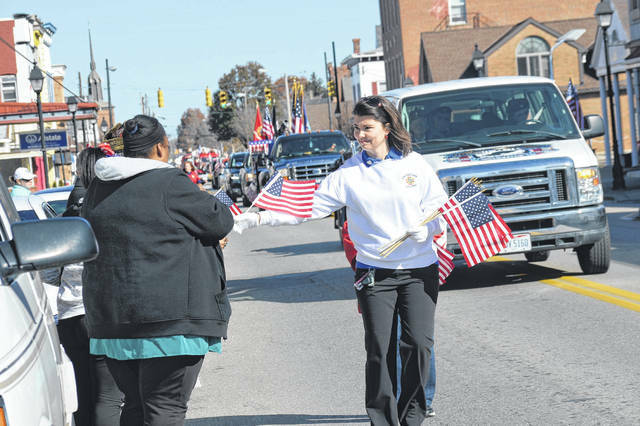 VFW Post 4464 Auxiliary hand out flags during the parade. New Life Lutheran Pastor and retired Army combat medic Michael Giese served as the day’s keynote speaker. 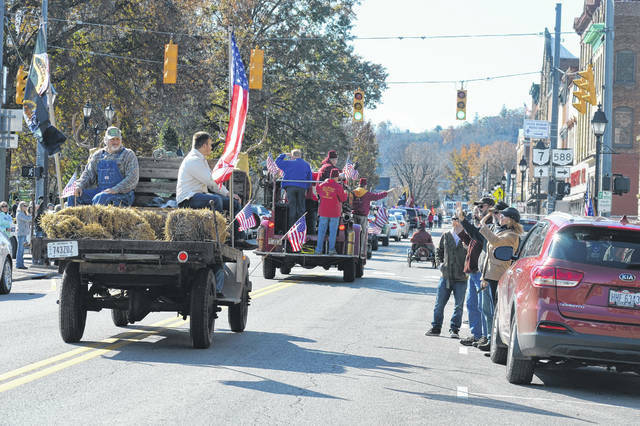 Floats and patriotic colors are a common theme displayed on floats during the Gallia Veterans Day Parade. 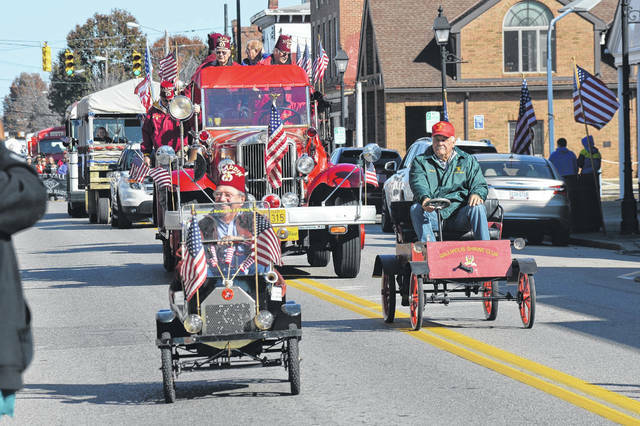 Tiny cars putter by as drivers wave to parade onlookers. 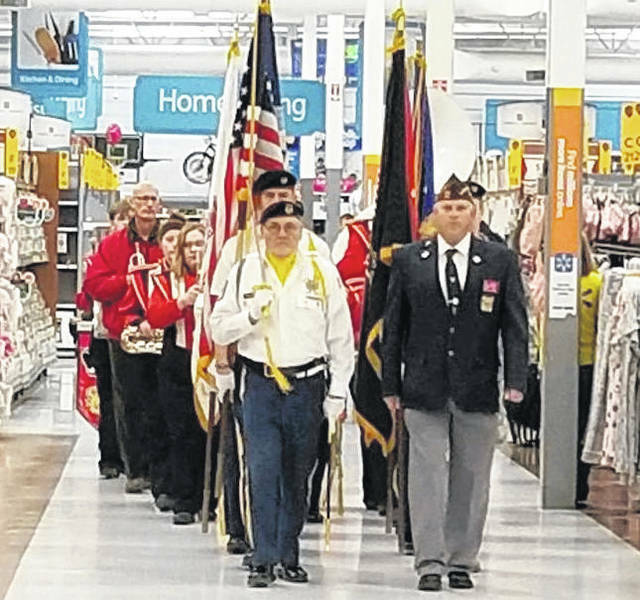 Veterans and VFW 4464 Honor Guard stride with the colors as part of the Tribute to Veterans at Walmart in Gallipolis Saturday. 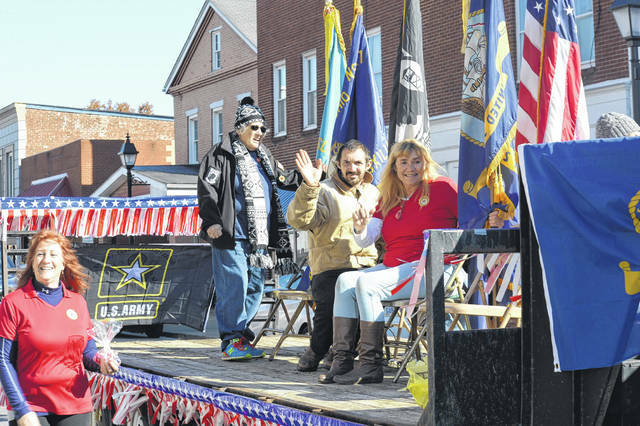 GALLIPOLIS — Area residents gathered Sunday in the Gallipolis City Park to recognize the service of veterans current and past after the annual parade down Second Avenue. Executive Director John Thomas, of the Gallia Veterans Service Office, served as master of ceremonies and led the Pledge of Allegiance. River Valley High School’s Phoenix show choir led the National Anthem and patriotic songs throughout the ceremony. Pastor John Jackson led the invocation. Thomas introduced guests Bill Mangus, of VFW 4464, Charlie Huber of American Legion Post 27, Bob McCarley of American Legion Post 161, Keith Jeffers of the DAV and AmVets, Larry Marr of the VVA, Jim Doss of the Marine Corps League and James Oiler of the Sons of the Union Veterans of the Civil War. 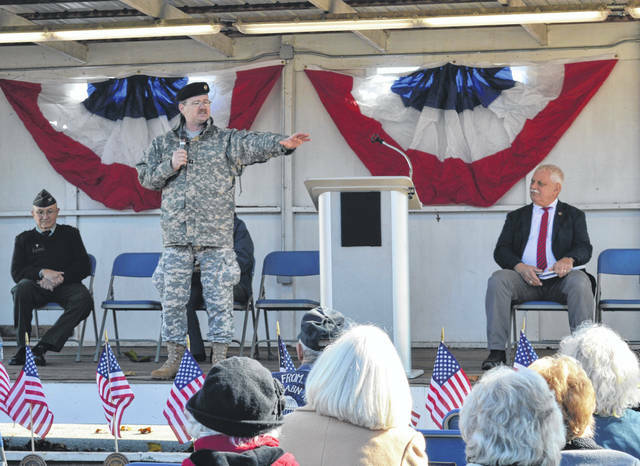 New Life Lutheran Pastor and retired Army combat medic Michael Giese served as the ceremony’s keynote speaker. Jackson gave the benediction and VFW 4464 Honor Guard held a rifle salute before the ceremony ended. 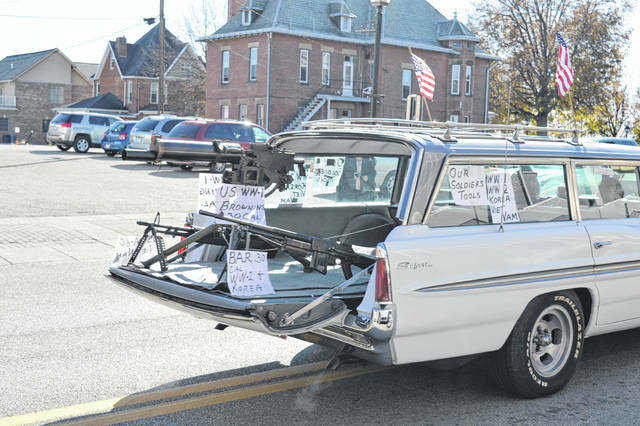 The Gallia Veterans Service Commission is compromised of Gallia veterans with representatives from AmVets, the DAV, American Legion, VFW and Vietnam Veterans. Commission members include Gary Fendrbosch, President, representative of Vietnam Veterans, Bob McCarley, Vice-President, representative of American Legion, Tom White, Secretary, representative of VFW, Keith Jeffers, representative of DAV and David McCoy, representative of AmVets. In the office along with Thomas are service officers Roger Houck and Jason Danford.